What a week we've had both in and outside of learning time. There have been many adventures to say the least. One of the most exciting adventures has been watching my blog visitors number climb, doubling any existing audience I've had in the past. Keeping this blog has been an amazing experience. I am in awe at all who visit, worldwide. The kind e-mails have made many a day, the latest being from Poland. Who would have thought? Certainly not me. My only regret is that I don't know who you are. If it's not too much to ask, I would love for you to follow my blog, so I'm able to look at your profile and blogs. Or leave a comment with a little about yourself and your blog address, so that I may see all the amazing ideas you have! Now for a confession. This week's learning time activities took FOREVER to plan, create, and execute. I'm not sure if other life adventures caused my brain to temporarily malfunction or what, but the process was agonizing. Instead of our usual one week shelf life for the last round of activities, my kiddos suffered through two whole weeks of the same thing. Mind you, they enjoyed them, but I felt awful day after day, when they'd ask if the new activities were ready, and I'd say no. It didn't matter how long I stayed up or how early I would wake up to get them done, the ideas and preparations just weren't coming along. Finally last night, I finished! When all activities were on the shelves, I took one look, and realized that we have an incredible week's worth of activities. The kiddos confirmed this today. We're continuing our study of Antarctica, along with diving into our new unit: Extreme Weather Conditions. This week we're focusing on blizzards, ice storms, and avalanches. Having experienced two ice storms in my life time already, one being quite severe (no travel or electricity for 2 1/2 weeks), this unit is very near and dear to my heart. I even pulled out old pictures for the kiddos. Bulldozer and Princess have done well with rhyming words. We haven't really touched too much on opposites though. I loved how these cards turned out! Dinomite fell in love with them. As I introduced the concept and activity to Bulldozer, it only took him five match ups to figure out what an opposite was and he went to town! Yay for him! Source: I created these cards as part of my Winter Printable Pack. For your free copy, please click on the link located at the bottom of this post. Had I realized how quickly my kiddos would gravitate to spelling, if only I had thought of these fun weekly activities sooner... Wow! Spelling has never been so popular. I only hope I can keep the creative juices flowing each week. This week, the kiddos are creating letters for each word using sugar cubes. It's more challenging than they thought it would be, but they've all fallen in love with the activity. Now if I could only get Bulldozer to stop eating sugar cubes. Gotta love that boy! Source: I created this spelling list. For your free copy, click HERE. I'm not sure what it is about these match up charts, but they always seem to be a favorite on the shelves. This week I decided to put together a review for Dinomite. Sure enough, he loved the activity and does fabulous with it. It only took him one time through to memorize what picture went with which phonogram. Dinomite has been learning about nouns, adjectives and verbs as part of his morning work. He's done so well with them all. This week I wanted to tie it all together using the Montessori Grammar Symbols. All three kiddos have amazed me. They are doing awesome with this activity! Bulldozer continues to need this activity on the shelves. I can't express enough how the simple act of writing numbers and letters in the salt has helped him learn how to write. There are days when he's really struggling with his motor planning. He'll ask for the salt tray, practice writing each letter or number in the tray, and then use a pencil or crayon to write it during his morning work session. The transformation has been incredible to watch. Source: The number cards used for this activity can be found at Homeschool Creations. I was making an icicle for another activity on our shelves this week, when I realized I had made a perfect strand of 10 beads, and just had to pull in a review of counting by 10s. Bulldozer fell in love with my icicles and because of this, I think he may finally be starting to understand the counting process. He has made such leaps and bounds over the past two months. Of course Princess and Dinomite already have this down, but it's always nice to review. What's not to love about penguins? Perhaps they'll make addition less painful for those in this family who despise it. That is my hope. So far all three kiddos have attempted the activity. This week is our big introduction into the world of measurement. Dinomite has started morning work measurement assignments. All three kiddos are measuring through this activity in the afternoon. I was worried measurement might be a difficult concept for one or more of the kiddos. Boy was I wrong! They love it and are so great at it. The smiles can't be wiped off their faces. In this activity they measure snowflakes, matching them up to the numbers slips provided. In one of the books we're reading this week, there was a map of the world, showing the most frequent places avalanches occur. As I studied the map I couldn't resist introducing the kiddos to a physical map of the world, where they could learn about different mountain ranges. They've heard so many of the names, but didn't know where they were located. Each card has the name of a mountain range, along with the continent it's located on. My kiddos are at the point now where they know where all of the continents are without hesitation. (I'm so excited about this!) Using the magnifying glass, and the color key located on the map, they locate the mountain ranges and place a markers on them. This has been a very popular activity. Source: The map I chose for this activity can be found at Maps of World. I created the cards. For your free copy, click HERE. Bulldozer has an amazing book, Disasters. He's currently obsessed with natural disasters right now. (He is the inspiration for this month long study unit.) Two of the pages in the book share information about some of the worst blizzards in history. I thought it would be great to have the kiddos soak up the information. There are very few extreme weather conditions that affect us personally, but blizzards are one of two at the top of the list, the other being ice storms. The kiddos always struggle when we say we can't travel or go outside because of winter storms, dangerously low temperatures and/or wind. This activity definitely caused them to think a little bit about the real dangers of these storms. We measured how much snow each blizzard left when it was done. The kiddos were introduced to word hypothermia, and learned it's definition. I could have gone a step further and had them identify where the blizzards were located on a world map, but I chose not to, since we already had another map activity. Source: I created these cards, using quotes from the book, Disasters. For your free copy of the cards, click HERE. 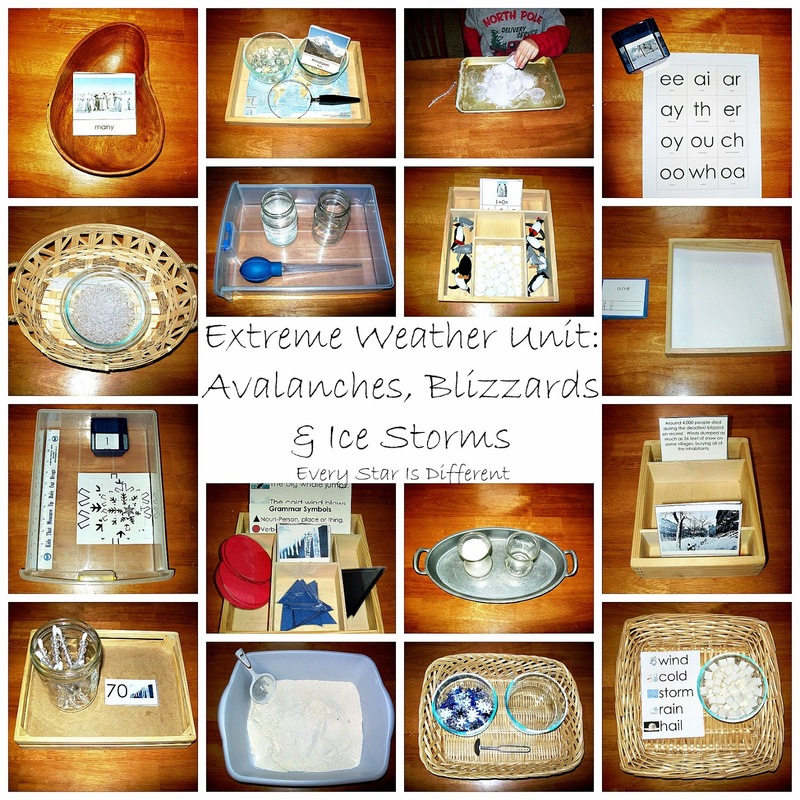 To help the kiddos learn the difference between the three types of extreme weather conditions: blizzards, avalanches, and ice storms, we had a sorting activity. The kiddos love the pictures. Source: I created this activity, for your free copy, click HERE. It's one thing to read about an avalanche, but to create your own... After researching avalanches in preparation for this unit, I couldn't resist the experiment of seeing just how they work. I created a rugged mountain of play dough, and then dumped layers of flour and salt, representing the different types of snow. Sure enough, I was able to create both kinds of avalanches. The kiddos are having way too much fun with this. We finished the intro to the activity by discussing the snowy mountain safety and the equipment they need to have with them if they decide to participate in any type of winter mountain athletic activity. Dinomite loves these drawing tutorials. It's been a while since we've done one. Source: I found this step by step drawing tutorial at How to Draw Animals. This week we start a new piano piece! We'll also be listening to some Beethoven music. There's been a blizzard. Everything is covered. The kiddos will sift through the "snow," (flour) looking for beads, snowflakes, etc. The kiddos will string the beads onto the white pipe cleaners to create their own icicles. All three kiddos did this activity today and loved it. Dinomite decided to create a tree branch, bent in an ice storm, instead of an icicle. I love their creativity! I had some sugar crystals in the cupboard. I thought they worked perfectly to show what sleet looks like. The kiddos always love a new pouring activity. The kiddos will transfer snowflakes from one bowl to the other using the spoon provided. The kiddos will use a baster to transfer water from one jar to the other. So far, they're all in love with this activity. To complete the unit study, we're working on updating our 72 Hour Emergency Kits, discussing how we can make our home and car ready, and creating a family plan for winter emergencies. If you'd like a free copy of the Winter Printable Pack, click on the link below. Next week we'll be continuing our Extreme Weather Conditions Unit with a focus on hurricanes and tornadoes. I hope you have a fabulous week! I just want to say thank you so much for your blog!! You have so many awesome ideas - I am constantly checking for new entries and inspirations. Have a wonderful day! Um, holy cow you thought of everything and it's all AWESOME!! And, then you shared it? Seriously, this is so great. Thank you so much!! Thank you Lisa. It helps to have a little guy who is obsessed over weather. He's very good at letting me know if I've forgotten something. :) Enjoy! Just found your blog! Love the various activities! Thanks for sharing! As usual So Many GREAT Activities! This post reminds me that we should do another round of weather activities.